Our mourning does not begin and end with the dead. It includes the injured, the relatives of the dead and injured, their friends, their co-workers, and the others attending the concert. It includes the first responders and those at the hospitals where the dead and injured we carried. The list has no end. Neysa Tonks, 46, Las Vegas, Nev.
Thomas Day Jr., 54, Corona, Calif.
Melissa Ramirez, 26, Los Angeles, Calif.
Jack Beaton, 54, Bakersfield, Calif.
Christiana Duarte, 22, Redondo Beach, Calif.
Denise Burditus, 50, Martinsburg, W.Va.
Jennifer Irvine, 42, San Diego, Calif.
John Phippen, 56, Santa Clarita, Calif.
Charleston Hartfield, 34, Henderson, Nev.
Rocio Guillen Rocha, 40, Eastvale, Calif.
Jenny Parks, 35, Palmdale, Calif.
Angie Gomez, 20, Riverside, Calif.
Christopher Roybal, 28, Corona, Calif.
Susan Smith, 53, Simi Valley, Calif.
Rhonda LeRocque, 42, Tewksbury, Ma. Quinton Robbins, 20, Henderson, Nev.
Sonny Melton, 29, Big Sandy, Tenn.
Lisa Romero-Muniz, 48, Gallup, N.M. The murderer is also dead, but I won’t sully the names of the innocent by including the guilty. We’re slowly hearing information about the dead in addition to their names: their lives, their jobs, their photographs. We’re also hearing stories about those who helped and saved others in the middle of this tragedy. There were many heroes. We may never know the names of all of the dead and injured, the first responders and hospital personnel, or the heroes on the scene who pulled people out of harm’s way. Journalists and others who keep records will call this the worst shooting in the United States. Others will discuss prospective gun control legislation and concert security measures. This is probably necessary as long as we don’t forget those who died, those who were injured, and those who tried to help them. The real tragedy is what happened at ground zero, and those who were in that place are those we mourn. See the CNN In Memoriam Page for updates. And hope the replacement era suits us better for goodness’ sake. North Korean hacked time at the fictional present moment. According to Schrödinger, most Americans will suffer no ill effects from an over-night reprogramming of their brains via software contributed by Microsoft. Concerned about the ethics of violating Star Trek’s temporal prime directive and voiding four months of seemingly real activity, the administration erred on the side of caution by taking no action in spite of the fact it was informed of the hack while it was happening. Some government philosophers said that if we got a “do over,” the same things would happen because they were destined to happen. Others said that “tweaks in the updates’ reprogramming code would keep people from doing the wrong things they did and the result would be a better world. The decision was finally made when Obama asked if reprogramming the clock and the brains of the populace would bring back Debbie Reynolds and Carrie Fisher. “Make it so,” the President said. Okay, moving onto the Kindle Fire Tablet. Click on the graphic below to go to the newsletter signup page. Just a few fields to fill out and then you’re done. The first place winner of the tablet and the two second place winners of a free paperback from Thomas-Jacob’s list will be selected in a random drawing August 17th. Albino County, October 20, 2009–Drill Instructor Boots Anderson slips quietly into barracks #3724 five minutes before Reveille on a cool Texas morning. The humidity is 68%, the pressure is 30.05 inches, the dew point is 56 degrees, and the 100 felines at the Albino County Rat Army Boot Camp are blissfully sleeping in the calm before the storm. Anderson scowls at the mess, the random hairballs, the shredded up bunks, the tipped over litter boxes, the complete lack of military grade standards of cleanliness and ambiance, “as though a tornado hit the freaking place during the long hours between taps and dawn,” he muses poetically. And then it hits. Anderson slings the open, CinchSak (R) 39-gallon lawn and leaf bag of empty cat food cans against the wall. Two hundred eyes pop open, one hundred pairs of ears go back, growls, snarls echo throughout the austere structure. Manx cats comprise company 816, so the denizens can’t turn tail and run, opting for caterwauling instead, the kind that makes Anderson’s skin crawl as though he’s covered in fire ants, the nasty buggers. The cats assemble smartly in the long center aisle between the rows of bunks. Their bearing is is straight and true like those perfectly posed goddess-style cats in art from ancient Egypt. “So you’re not a lost cause after all, you lousy, good-for-nothing curs, you miserable excuses for ratters, you sloppy-as-dogs critters, you alleyway varmints. You Siamese.” He adds that for good measure, knowing it’s a low thing to say to a Manx. At this moment (05:25 central), the emergency doors at the far end of the building are kicked open and the Feds, damn their lousy timing, crash into the room with assault rifles, mace, snarling dogs straining on leashes, and enough spotlights to make the cats’ eyes look like his chaotic collection of old marbles before his brother lost them to Dexter Smith in the school yard before the cat got his tongue. “General Mark Sirius, Homeland Security SWAT Tsar,” shouts the dog-eared fat officer who rolls into the room like like a basset on a acid. “Are you serious?” yells Anderson. “It’s a little late for that, General, the cats bugged out when you busted in,” says Anderson. “So what,” says Anderson, grinning like a Cheshire cat that’s starting to fade into the woodwork. Sirius is stoked like a cat on a hot tin roof, but he’s not wagging his tail now because Anderson has faded away into the Texas morning, a morning when the winds are gusting to 23 mph, a morning when the old general should head to the dog house early and hang his head while his masters tell him Sirius is a bad puppy for not putting all those cats in a great big hat and bringing in for questioning. Anderson laughs from a nearby tree. Once the FEDs leave, it will be back to business as usual. All he has to do is open a can of tuna and the troops will pass in review, soon, if not smartly, the sorry flea-bitten strays. Cubans and Americans haven’t had much access to each other’s literature for fifty years. Even though relations are becoming more normalized between the two countries, the overall embargo remains in place. Personally, I don’t think an embargo on consumer products ever made sense, much less now. Click on the link in the paragraph above to see why PW thinks the embargo should be lifted. Or, if you already believe it should be lifted, you can read the petition here. The embargo can only be lifted through Congressional action. We’ve all seen wedding stories like this in movies, novels and television shows. Some of those stories might even be real. However, historian Martha Kohl, a fifteen-year specialist at the the Montana Historical Society in Helena, found that the reality of Montana weddings over a 150-year period was every bit as romantic and absorbing as the fiction. If you live in or near Helena, you can meet the author and enjoy the society’s new exhibit “And the Bride Wore…Montana Weddings, 1900-1960” on January 10th, between 6:30 and 8:30 p.m. at the MHS headquarters at 225 North Roberts. Through engaging stories of romance, insightful analysis, and historic intriguing photographs, I Do: A Cultural History of Montana Weddings provides an intimate and surprising look at an important tradition. I Do journeys through the last 150 years of Montana history, from the 1860s gold rush to the internet age, to reveal the lives of ordinary people, from Finnish homesteaders, Chinese restaurateurs, and Métis fiddlers to struggling miners, Blackfeet students, and Jewish merchants. The Montana Historical Society’s newest temporary exhibit, will examine how history has shaped weddings—and particularly wedding fashion—during the first half of the twentieth century. Sixteen delightful and diverse dresses will be on display, including a hand-stitched dress made of white lace and yellow silk ribbon (worn in Butte in 1907), a Crow elk-tooth dress (worn in Lodge Grass in 1945), and a ballerina-style white dress of synthetic satin, lace and tulle (worn in Hardin in 1957). An opening reception will be held January 10, 2013, from 6:30-8:00. The opening will feature a wedding dress fashion show, a 1950s style cake and punch reception, a book signing by Martha Kohl, author of I Do: A Cultural History of Montana Weddings, and Slovenian wedding dance music. Don’t miss the fun! Viewers will be asked to participate in the exhibit by voting for their favorite ensemble and trying their hand at an old-fashioned Singer treadle sewing machine. The dresses will remain on exhibit through November 2013. The exhibit is listed on line here with contact information and other details. A long-time member of the Montana Historical Society, Malcolm R. Campbell is the author of contemporary fantasy novels partially set in Glacier National Park, including “The Sun Singer,” “Sarabande,” and the upcoming new adventure, “The Seeker.” Watch the trailer. Even though I haven’t read “Newsweek” in over ten years, I’m sad to see it go, just as I was also sad to see many of the other weekly and monthly print magazines I grew up with go out of business over the years. With the loss of these magazines, the public (and writers) lost a lot of outlets for short stories, features, commentary, viewpoint and the longer-form journalism that wouldn’t fit in the daily newspaper. Founded in 1933, “Newsweek” seemed destined to trail behind “Time Magazine” in circulation. However, I found it more accessible than “Time” during the days before it began going down hill. As a subscriber, the first indication of coming hard times was the size of the magazine. It began getting thinner and thinner as pages were cut even though the subscription price increased. I mourn the death of magazines because they presented in-depth stories most newspapers didn’t have the time or space to cover. Our Internet world is too full of hype, instant-experts, short-attention-span articles, articles filled with opinions and commentary, and all the other rush-to-judgement “facts” and “notions” the social media are famous for. Online “news,” to the extent that it can be called news, has lost most of the traditions of solid, professional reporting. Another reason I stopped reading “Newsweek” was due to its blurring of the lines between good journalism and bad journalism. Good reporters never tell you what they feel about a story, much less include ideas/views that aren’t attributed to a reputable source. True, news magazines did present analysis, but “Newsweek” often took that as license to write “news stories” in which the facts and opinions were mixed up into the kind of story I didn’t even expect my college journalism students to be writing once we got a ways into the semester. I got so ticked off at “Newsweek” on one occasion, I tore out several of the major news stories and went through them with a red pen marking every opinion and every unattributed fact. I sent it to them with an “F” on top and asked which journalism schools the reporters flunked out of before they were hired by the magazine. I never heard back, of course. Now, what “Newsweek” did has become so prevalent that many news consumers don’t even realized they’re often reading the reporter’s notion about the news rather than the news. When I mentioned the lack of straight news in a Facebook status update recently, one friend said “I know what you mean. That’s why I always rely on XYZ,” whereupon she mentioned one of the most biased news personalities in the business. So, I lament the loss of “Newsweek’s” print edition along with everything else that used to be considered standard, solid journalism before the “happy news” and it’s foul cousin, “My uninformed view is just as valid as the expert’s informed view” kind of reporting took over. I’m happy to announce the publication of my e-book short story “Cora’s Crossing” released this week by Vanilla Heart Publishing. Priced at only 99 cents, this Florida Panhandle ghost story is already available on Kindle, PDF on OmniLit, and in multiple formats at Smashwords. The Nook version will be available soon. If you do a Google search like “Florida Ghost Stories” or “Swamp Ghosts” or “Southern Ghosts,” you’ll get hundreds of hits for spooky stories, haunted cemeteries and houses, and ghost hunter expeditions. Stories and legends are, as authors and journalists often say, part of the “local color”—the yarns, history and experiences that make places unique. Local color in Marianna, Florida, the panhandle town most tourists know as the home of Florida Caverns State Park, includes a local legend about the haunted Bellamy Bridge across the Chipola River a few miles north of the caves. The story has been around for over 150 years and focuses on a young bride who died when her wedding dress caught fire. Since then, she has—some say—taken up residence at the old bridge, and possibly at the wood bridges that crossed the river before that. Local historian Dale Cox writes about the differences between the legend and the real-life Elizabeth Jane Bellamy in his new book The Ghost of Bellamy Bridge. I’ve always enjoyed reading stories in which everyday people suddenly run afoul of ghosts (and other creatures) out of local legends. Truth be old, when I last drove over Bellamy Bridge, I didn’t see a ghost. However (and this is important), I knew better than to drive over it at night. In “Cora’s Crossing,” two young men do drive over it at night and find more than they bargained for when they discover an injured young woman on the shoulder of the road and learn that the people who put her there are coming back. The Florida Panhandle is filled with remote coastal areas, swamps, blackwater rivers, and other locations that are perfect for ghosts. Growing up there, I heard hundreds of ghost stories, usually at night when we were on Scout camping trips. Most of them began with, “On a dark and stormy night not far from our camp site. . .” Nothing like falling asleep with a ghost story on your mind. My Boy Scout troop never met up with any of the ghosts in those stories. But what if we had? Worse yet, what if I had driven my ancient Chevy over Bellamy Bridge on a rainy night? I promise you, I didn’t. This story never really happened. Feel free to go visit the bridge during a thunder storm. Everything will be fine. If you’re a fan of ghost stories, you may also like “Moonlight and Ghosts,” a story about the ghosts in an abandoned psychiatric hospital. When Glacier Park’s Centennial Program Committee received the George and Helen Hartzog Volunteer Group Award for promoting the park’s 2010 centennial, many visitors were unfamiliar with the man who led the National Park Service between 1964 and 1972 or with the award established in 1998 (and subsequently supported via a fund created by his wife) to honor those donating time to help the parks. Originating with Mengak’s dissertation at Clemson University, the book draws heavily on twelve years of interviews conducted with Hartzog and other key officials. Hartzog died in 2008. Kurt Repanshek (National Parks Travler) writes that Hartzog “was a cigar-chewing, Scotch-loving, Stetson-wearing, lover of fishing, hard-charging director who often knew exactly what he wanted and found a way to get it. One way or another.” His review of the book is posted here. This biography of the seventh director of the National Park Service brings to life one of the most colorful, powerful, and politically astute people to hold this position. George B. Hartzog Jr. served during an exciting and volatile era in American history. Appointed in 1964 by Secretary of the Interior Stewart Udall, he benefited from a rare combination of circumstances that favored his vision, which was congenial with both President Lyndon Johnson’s “Great Society” and Udall’s robust environmentalism. Hartzog led the largest expansion of the National Park System in history and developed social programs that gave the Service new complexion. During his nine-year tenure, the system grew by seventy-two units totaling 2.7 million acres including not just national parks, but historical and archaeological monuments and sites, recreation areas, seashores, riverways, memorials, and cultural units celebrating minority experiences in America. In addition, Hartzog sought to make national parks relevant and responsive to the nation’s changing needs. All three books, from Vanilla Heart Publishing, are available on Kindle. “Sarabande” and “The Sun Singer” are also available in trade paperback. Did you know that many of the scenes in the 1986 action/adventure movie “Top Gun” were filmed aboard the aircraft carrier USS Ranger (CVA-61) pretending to be the USS Enterprise? Now decommissioned, the USS Ranger is en route to becoming a museum in Fairview, Oregon through the efforts of the USS Ranger Foundation. 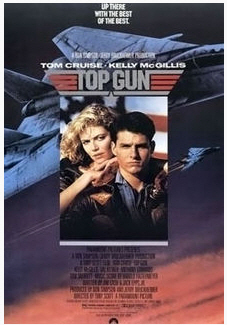 In support of this project, the foundation is sponsoring a 25th anniversary showing of “Top Gun” as a fundraising project on Sunday, May 6, 2012 at the Mt. Hood Theatre, 401 E. Powell Blvd, Gresham, OR 97030, 12-3pm. Click here for more information along with a nice film trailer showing some realistic launch and recovery operations along with the kind of flying hi-jinks you might expect out of any character played by Tom Cruise. If you live in or near Gresham, this movie will make for a great afternoon of entertainment in support of a good cause!